The Nilfisk BR 855 is a mid-size scrubber dryer that delivers performance, ergonomics and reliability. It is large enough to cover ground quickly but remains compact in its design. 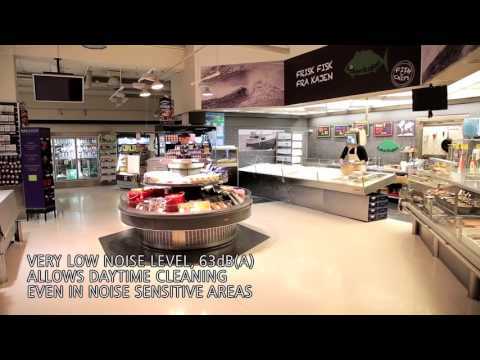 The BR 855 has an extremely low sound level due to its integrated vacuum motor, which means that cleaning at any time is possible in even noise sensitive areas. It has excellent traction for efficient double scrubbing and superb drying efficiency. The innovative Ecoflex system gives the ability to temporarily boost water, detergent and brush pressure for more aggressive cleaning needs, while at the same time keeping the consumption controlled. The adjustable scrubbing pressure also ensures better results regardless of the level of dirt. The BR 855 includes the user friendly, waterproof OneTouch control panel which makes this model simple to operate. It is easily manoeuvrable which makes cleaning in congested areas easier and adjustable scrubbing pressure means the BR 855 can be used for a wide range of cleaning tasks from daily scrubbing to restoration. In addition, the large battery compartment allows for a 400Ah battery tray giving you more than 4.5 hours running time. The BR 855 allows operators access from either the right or left hand side. The Nilfisk BR 855 is covered by a manufacturer's three year warranty from the date of purchase, covering all parts and labour* (*conditions apply).